The accidental discovery of gold in 1848 at Sutter’s Mill in Coloma started a bonanza that brought California fame and gave it the title of the “Golden State.” The Gold Rush of 1849 and the subsequent influx of settlers led to California becoming the 31st state in 1850. The concentration of gold ore, and the market value of gold determine whether a deposit is a mineable orebody. The highest grade deposits are associated with quartz veins. Gold also occurs as disseminated particles incorporated during magmatic rock formation or during subsequent chemical alteration of the host rock. Primary gold occurrences are termed lode deposits. Mineralized rock and gold- bearing veins release gold particles during the weathering process. Because of its high specific gravity and resistance to weathering, these sedimen- tary gold particles are easily concentrated by streams and rivers to form placer gold deposits. There are three types of gold mining today: underground mining of high-grade lode and placer deposits, dredging of surface placer deposits, and open-pit mining. A technique called heap leaching is commonly used to remove finely disseminated gold from low-grade ore. In this process, mounds of crushed ore are placed on an impermeable pad and sprayed with a dilute cyanide solution. The cyanide solution percolates through the ore and dissolves fine gold particles. The gold is then electrolytically recovered from solution and poured into ingots. Gold is also a byproduct of sand and gravel production and base metal (copper, lead and zinc) mining. 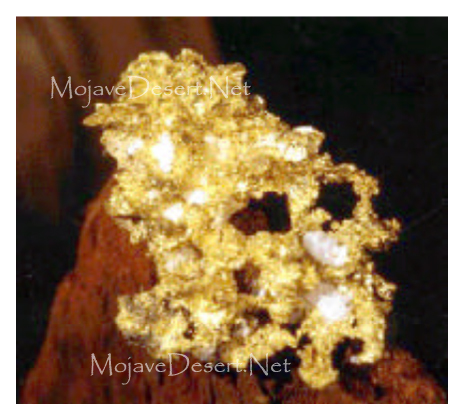 California’s most important gold deposits have been found in the Sierra Nevada, Klamath Mountains and Mojave Desert. Significant deposits have also been developed in the Peninsular and Transverse Ranges and the northern Great Valley. Unmined low-grade deposits occur statewide. In the Coast Ranges, low-grade gold deposits are associated with low-temperature mercury mineralization. Most malleable and ductile of all metals. One ounce of gold can be stretched into a wire more than 40 miles long. Gold can be worked into a layer measuring 1 millionth of an inch. There are certain produced acid and alkaline compounds that will dissolve gold. The best known is aqua regia, a potent combination of hydrochloric and nitric acid.